Happy Wednesday! 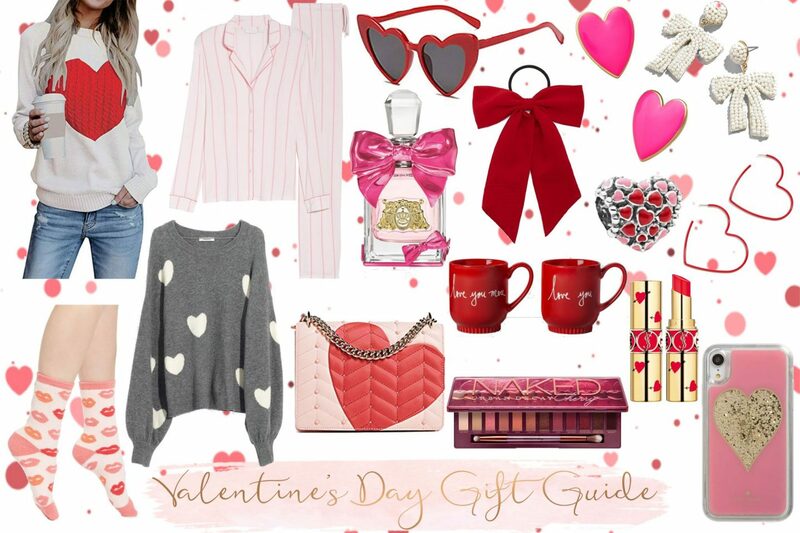 Today I’m sharing the best Valentine’s Day gift guide for that special girly girl in your life and if they happen to be a blogger then even better. This is technically a wish list of things I would want but I think any girl can benefit from it as well or maybe you want to treat yourself like I’m going to do so here’s everything I think a girly girl will like of all the best Valentine’s Day gift guide! I actually just wore this here. It’s a pretty cute sweater and perfect for Valentine’s Day. It’s under $30 so if you’re looking to gift someone or just wear it yourself then this is great. If you wan’t a sweater that is more subtle and not in a red then this is grey and has big heart print. It’s a bit pricey but it’s not only for Valentine’s and can be worn all year. Who doesn’t love pajamas? I live in pajamas so getting some that are themed or just in your favorite color is perfect. I love ones that are a set so I can mix and match them. I appreciate socks a lot more now. I didn’t use to be a fan of socks but with the weather they have been so handy and a thoughtful gift. Also how cute is this kiss print pattern? Now this is a pretty bag. I actually love pink and red together. If you are wanting to treat yourself and get a Valentine’s theme bag then this is the cutest one I found. I have these and I love them. They are less than $10 and are great dupes for the designer pair. They come in a lot of colors so you can get red for Valentine’s or another color for everyday. Another one I have but totally recommend. It can be used for any red holiday and it gives your hair a more polished look. It has a few different colors and is under $3 which is so affordable. I love a themed mug and I mean who doesn’t? This is so cute and from Target which has so many other cute designs too. I love it’s a couple set so you and boo can match. I have been in awe of BaubleBar earrings and as soon as I saw these I knew they would make the gift guide and my wish list. They come in my iconic hot pink shade or a traditional red for Valentine’s. Okay I could not include these. I love anything with bows and bow earrings so these had to be added. They aren’t necessarily Valentine’s but a great gift. I live for heart hoops. I used to have a couple pairs in my middle/high school days and loved them all year round. I think I’m going to buy them again to relive it and they are still cute. If someone you are gifting has a Pandora charm bracelet like myself then maybe a new charm would be great and you can get a themed one like this or something with meaning to you. Moving on to makeup and getting an eyeshadow palette is a great gift. I was looking at this one and it has some pretty colors that are perfect for now and throughout the year. A pretty lipstick? Yes please! I saw this and immediately had to put it in. I have always wanted one of their lipsticks and this has the cutest packaging so if you want a glamorous lipstick then this is the one. Another that had to go on my list while I was planning this post. I saw this in store and of course loved it since it was themed around bows but it smells amazing as well. I so need this and have it on my wish list. I do love a good phone case and especially when it’s themed or matches my outfit. I have always wanted a Kate Space one and this is just the cutest. I actually just bought this for myself so I can’t wait to have this hot pink sparkle case to put on my iPhone. I used to have one similar to this back when I was in middle school for my old Razor phone and now I have it for my iPhone. Last is a candle. I have recently gotten into candles and saw this one and saw it was perfect for Valentine’s Day. Anything smelling like roses screams Valentine’s so I had to include it in the gift guide. That was the best Valentine’s Day gift guide for her! I hope this gave you some gift guide inspiration. If you want more then here is last year’s version. I know it’s more of a wish list but I think it’s a two in one. Either you are buying for someone or yourself then whatever because it only matters what makes you happy. So I hope you enjoyed this best Valentine’s Day gift guide and let me know if you are getting yourself anything as I’d love to know! Great minds think alike. The style on this post is beautiful and the gifts are really great! Thanks Jaeda! Glad you like and think it’s a great post! I love the sunglasses and the sweater, would totally go together in an outfit plus they are versatile too. Thanks Joan! You’re totally right and I actually did post them together in my last post. Thanks so much! I hope you do and he gets you something nice! I love these!! I honestly can’t get enough pink and red, so these would be my favorites – Valentine’s day or not! I will have to pass on those adorable socks though to try to get a pair as a gift! Thanks Tessa! I love them all the time as well and love wearing the colors. Hope you pick up the socks! Thanks Jodi! It’s mine too and I love the theme of it all. Thanks! It is and that’s why I bought them for myself! So many cute things! I am definitely eyeing those pajamas. They are so cute and look comfy! Thanks Carolyn! I know me too! I love a good pair of pajamas! Thanks Julie! I know it is so cute. Maybe you could borrow it? I know that’s what my mom does. Thanks Nicole! You do and it’s so nice even can be for all year if you want.